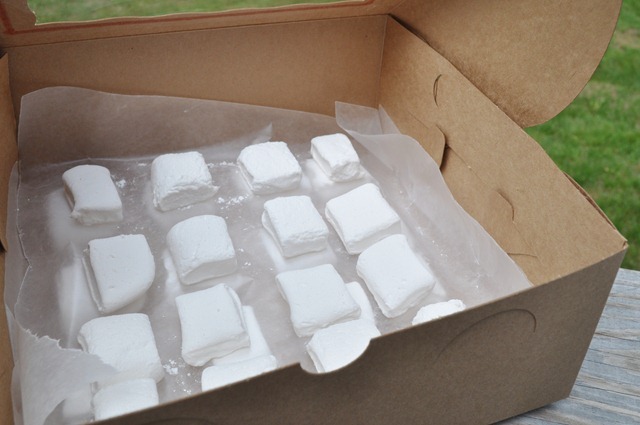 I made these marshmallows for a camping trip over Memorial Day weekend. I had everything on hand so I quickly whipped them up before we left. It was really interesting to see them come together, as I had never even thought of making my own. They weren’t very difficult but I would recommend getting a candy thermometer, if you don’t already have one. I don’t and it made it a little difficult (think standing over the boiling candy with a latte thermometer). They tasted almost exactly like the store-bought variety and were just a bit chewier. I’m not sure if this is how they are supposed to be or if my temp was off. They are a bit of a pain to cut but well worth the extra patience! They were pretty fantastic, though…especially once roasted! Yum! I don’t think any were around long enough to make it into a s’more but I’m sure it would be amazing. Lightly spray the inside of an 8"x8" pan with vegetable cooking spray. Generously coat with powdered sugar and set aside. In a saucepan, off the heat, combine the remaining 1/3 cup of water and the granulated sugar, corn syrup, and salt. Place the pan over medium-high heat. Clip a candy thermometer on the inside of the pan, making sure it doesn’t touch the bottom. Cook the mixture without stirring until reaches 240°. With your mixer on low speed, very carefully add the hot syrup to the softened gelatin. Add the vanilla and increase the speed to medium-high. The mixture will start out clear, but quickly turns very white. Beat for about 8 minutes, or until the marshmallow gets very thick and sticky, and starts to pull away from the sides of the bowl, in string-like pieces. Spread the mixture into the prepared pan using a lightly oiled spatula (I left a good deal of the mixture in the mixing bowl because I didn’t have a lot of time to fight with it…it was stuck!). Press evenly into the corners of the pan. Set aside for at least 1 hour, or until the mixture is firm and cool. Sift the powdered sugar into a shallow bowl. 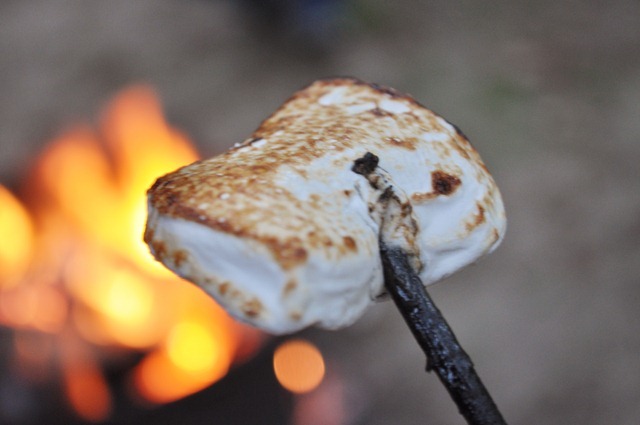 Run a wet knife around the edge of the cooled pan to loosen the marshmallow. Remove the marshmallow from the pan. Cut into squares, wetting the knife as needed, to keep it from sticking. 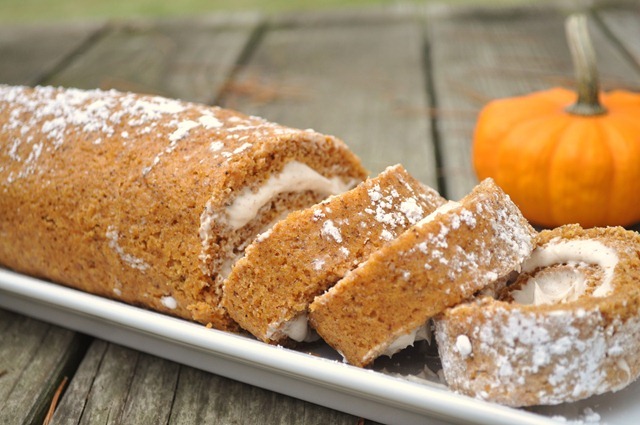 Toss in powdered sugar, shaking of excess when removing. 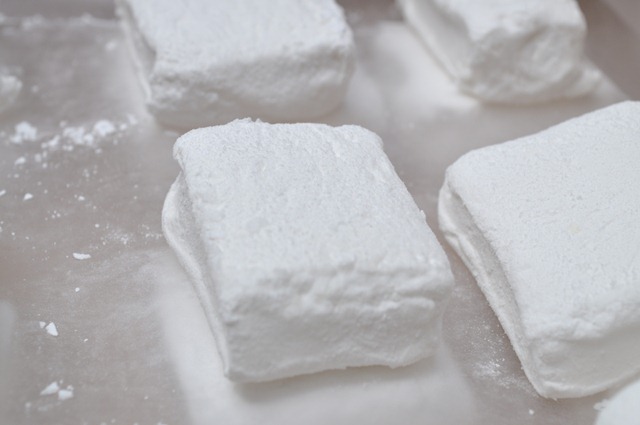 Store marshmallows in a single layer, or in layers separated by wax paper. I made this cake for my parents’ anniversary dinner that we threw for them yesterday. We would normally order one but I decided to try my hand at cake building! This was my first-ever attempt at a layer cake and I would say it was a success! I ran out of frosting or I would’ve decorated it a bit more. I didn’t get a picture of the finished product since I assembled it at their house but I made a chocolate “38” (38 years!) and some little designs, froze them, and then put them standing on the top. Work in progress…the end result was a little smoother. I over baked the cake a little bit but the flavors were great. 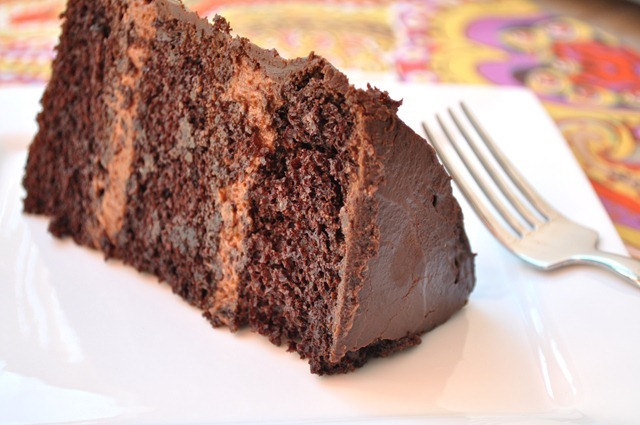 It is a chocolate cake with chocolate mousse filling and frosted with chocolate ganache. I could’ve eaten the ganache by the spoonful!! It was incredible. The filling was really good too, though not a true “mousse.” The lightness was a perfect contrast to the decadent frosting. I wish I would’ve put it together the day before and let it sit in the fridge overnight because I sampled the slice after photographing it and it was even better than yesterday! Stay tuned for a celebratory giveaway happening around these parts by the end of the week. 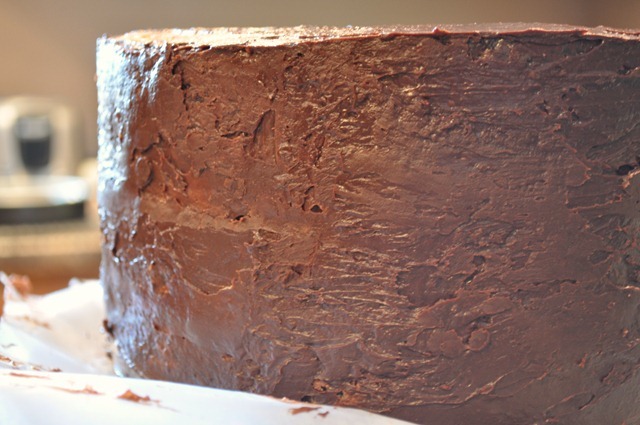 Note: this recipe makes two 8” or 9” cakes so I had to make 1.5 of this for three layers. Preheat oven to 350 degrees. Butter and flour two 8 or 9 inch round cake pans. In the bowl of an electric mixer fitted with the paddle attachment, combine the buttermilk, oil, eggs and vanilla. With the mixer on low, slowly add the dry ingredients to combine, occasionally scraping downs sides of bowl. Slowly add the coffee and mix just until combined. Pour into prepared pans and bake for 35-40* minutes or until cake tester comes out clean. Allow to sit in pans for 10 minutes, then invert onto a wire rack to cool completely. 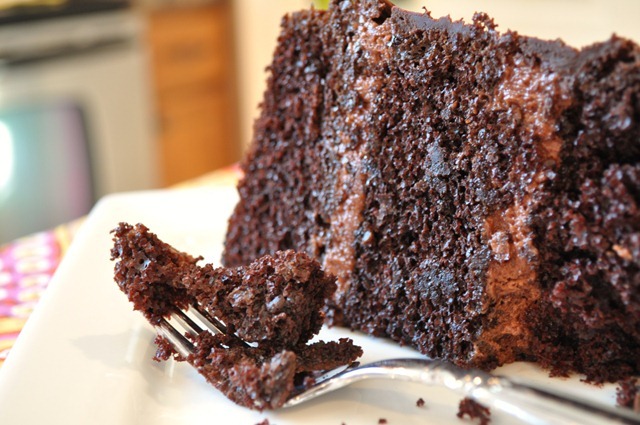 Once cooled, store in an airtight container until your ready to assemble your cake. *I would start testing them around 25 minutes next time so I don’t over bake them. In a medium mixing bowl, combine the condensed milk and melted chocolate. Gradually stir in the water. Add the pudding and mix to combine. Chill for 30-60 minutes. Whip the cream to stiff peaks and very gently fold, do not stir, into the chocolate mixture until not white streaks remain. Cover and chill until ready to use, at least 1 hour. 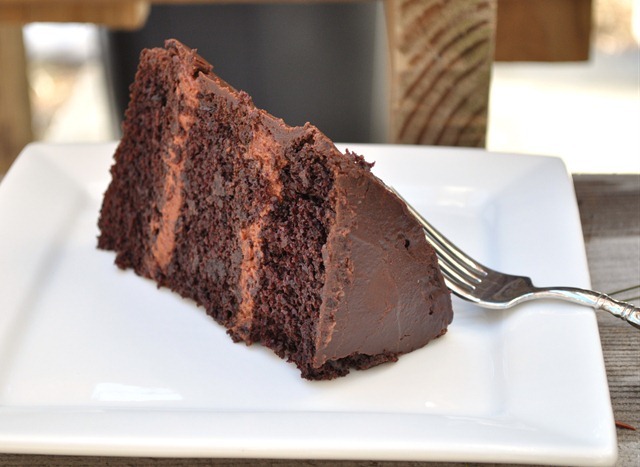 Place chocolate and espresso powder in a heat-proof bowl. Heat cream in a saucepan until just boiling. Pour over chocolate, cover, and allow to sit for about 5 minutes. Whisk until smooth. Chill until it reaches a spreadable consistency. 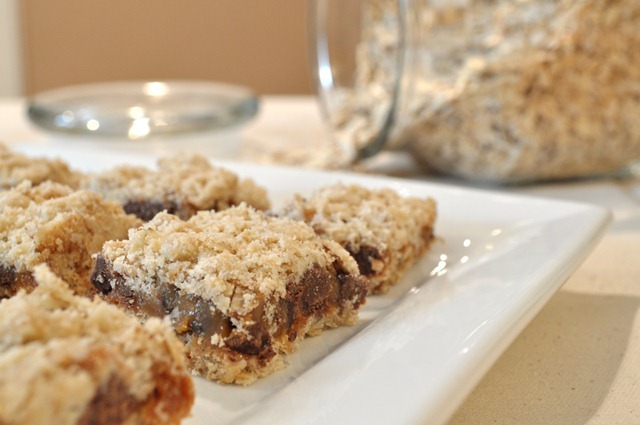 I made these bars for a sweet treat for the Super Bowl and am finally getting the recipe together. We’ve had these many times at family events and there are so many different recipes out there so I just picked one out of a family cookbook to try it out! They turned out a little dry but they were still yummy! 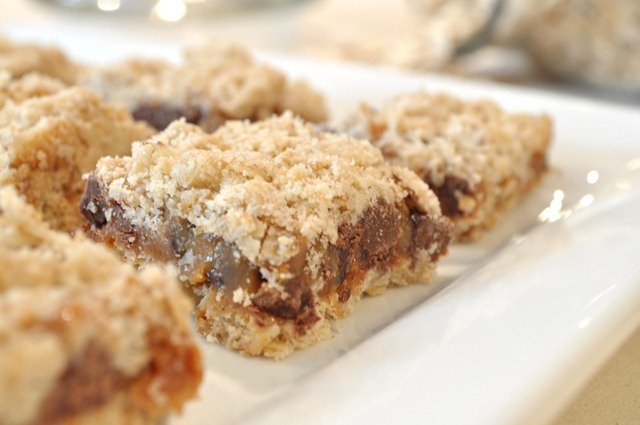 I love the chunks of chocolate mixed into the melted caramel, and the oat crust and topping adds a nice salty element. Preheat oven to 350 degrees. Begin melting caramels and cream together in a medium saucepan over medium-low heat, stirring occasionally. Continue until fully melted and combined, then remove from heat and set aside. Meanwhile, in a medium mixing bowl, combine flour, oatmeal, brown sugar, baking soda, butter, and salt. Press about 3/4 of the mixture into the bottom of a greased 9×13” baking dish. Bake at 350 degrees for 10 minutes, or until lightly browned. Sprinkle with chocolate chips. Spread with the melted caramel/cream mixture. 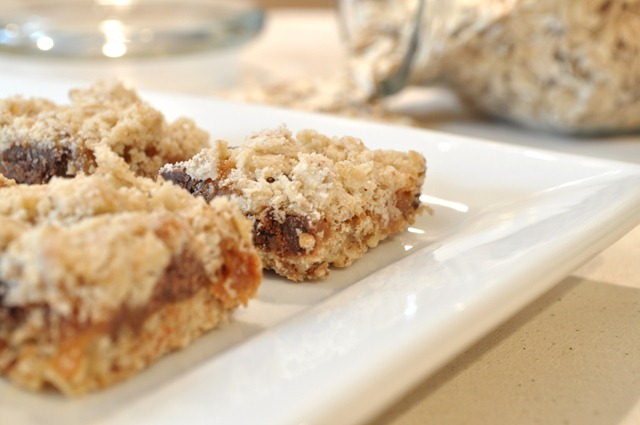 Sprinkle with remaining oat mixture and return to oven. Bake for an additional 15-20 minutes. 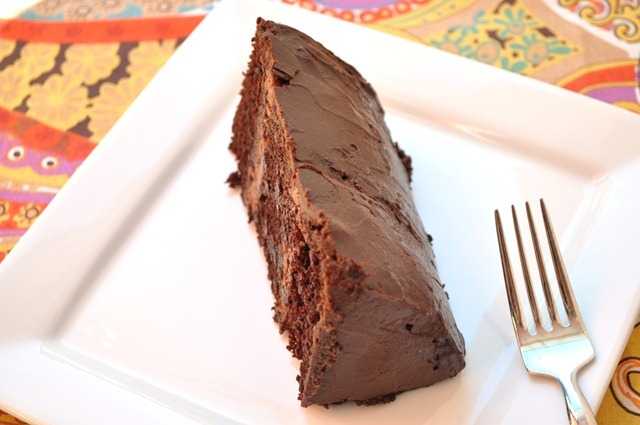 Allow to cool before slicing. The recipe originally said to put half of the oat mixture on the bottom and the other half on top but I think that’s why mine came out a bit dry…I think 3/4 on the bottom should fix this. I’ve had some lemons sitting in my fridge for a bit so I decided to use them up today to bring to a birthday/football party. 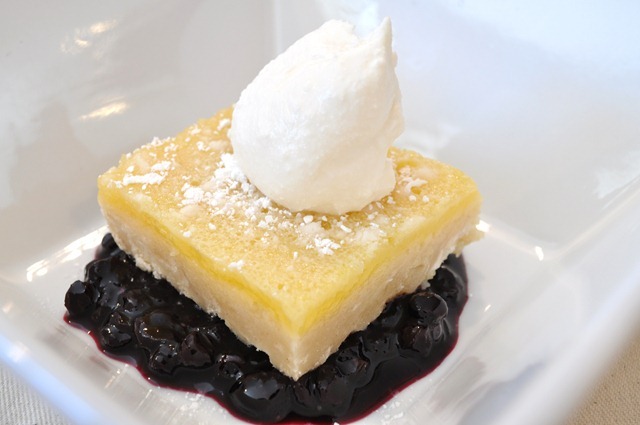 I had never made lemon bars before but remembered the dessert from this post that was absolutely dreamy! 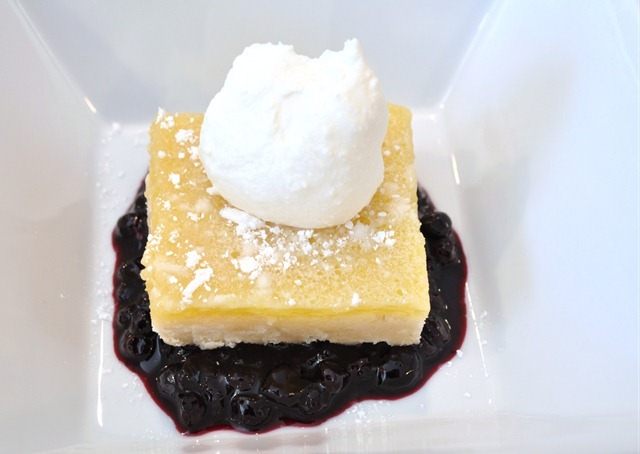 The sweet blueberries complimented the tart lemon so well and I just had to try to replicate it. These flavors just go so well together! 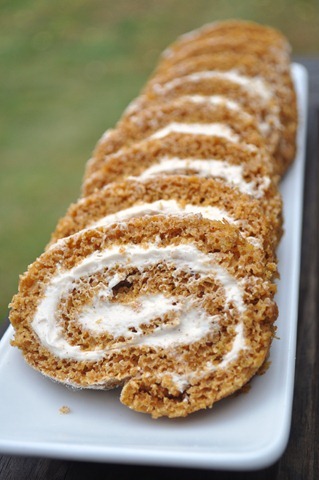 Topped with a dollop of fresh whipped cream, this tastes so fresh and summery…even in the winter! I will definitely be making this again. Preheat oven to 350 degrees. Grease a 9×13 baking pan. In a bowl, combine the 2 cups of flour, the 1/2 cup powdered sugar, cornstarch, and salt. Using a pastry blender, cut in butter until mixture resembles coarse crumbs (I cut the butter into small cubes and mixed it with my stand mixer until crumbs formed). Press mixture into the bottom of prepared pan. bake 18 to 20 minutes or until edges are golden. Meanwhile, for filling, in a medium bowl stir together eggs, sugar, 3 tablespoons flour, lemon peel, lemon juice, and cream. Pour filling over hot crust. Bake for 15 to 20 minutes or until center is set. Cool completely in pan on wire rack. Cut into bars. Cover and store in refrigerator. Sprinkle with powdered sugar before serving, if desired. Combine 1 cup of the blueberries, water, sugar and lemon juice in a small saucepan. Cook over a medium heat for about 10 minutes. Add the rest of the blueberries and cook for 8 minutes more, stirring frequently. I added a little bit of cornstarch to thicken it up but it would’ve been fine without it.